It's a perennial problem for me when I get back from a trip - especially when there are lots of pictures. The unidentified location. I know roughly where it is, but not exactly. This is especially exasperating when I've taken a picture specifically to record some detailed information, such as the location of a bridge that is not marked on the map, or, more often, the absence of one that is marked! Then, amongst the usual press releases from marketing companies that plop into my inbox (do all outdoor bloggers get this?) finally there was one that hit the spot - the latest compact camera from Pentax that not only takes pictures and movies, but has it's own built in GPS receiver to geotag every picture. The camera is the Pentax Optio WG-1 GPS That link goes to the non GPS version, but the specs are otherwise identical, and it will give an idea of the camera's capabilities. The biggest problem for me in Scotland this May was the continual rain that severely curtailed the taking of pictures, and this is where the Pentax camera is ideal for the outdoors adventurer, whether walking, climbing, kayaking or even snorkeling. It's waterproof - so you can even use it under water! 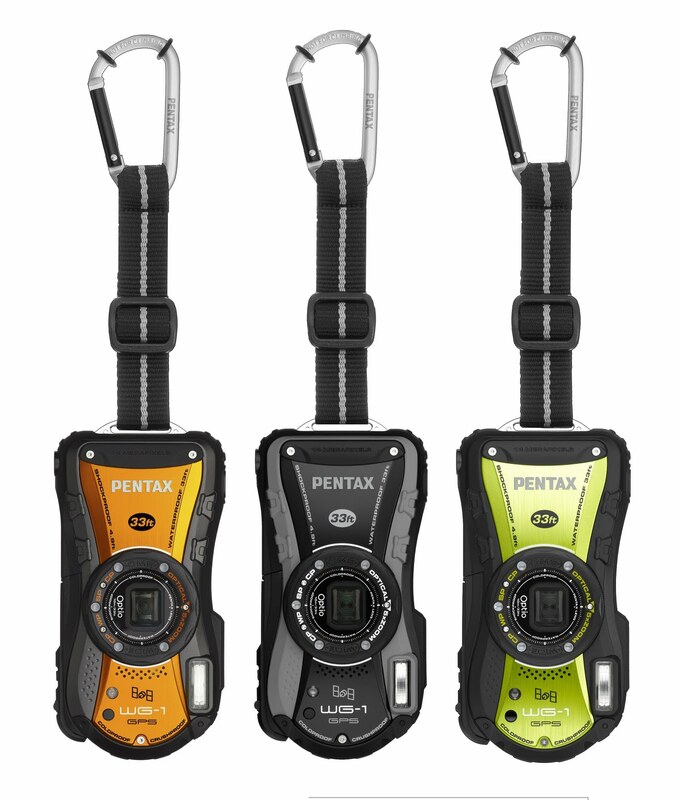 The Pentax Optio WG1 GPS compact camera has been specifically designed to withstand the rigours of an outdoor expedition and includes geo tagging functionality too. With this unique GPS functionality, the camera automatically stores the ground positioning data of your shot as well as when you took it. So, back home, you can locate exactly where and when you took any particular image or video, no matter how far off the beaten track you have gone.. The camera can also withstand a freefall from 1.5 metres, weight pressure of up to 100kg, temperatures down to -10°C and is waterproof to a depth of 10 metres. Housed in a rugged aluminium-alloy body, the camera is equipped with 14 megapixels, 2.7” LCD monitor, wide angle 5x optical zoom and its 1cm macro mode enables you to take all types of photos from close-ups to landscapes. I'm impressed with the spec, and have asked for a camera to review in the next month or so, which should be just in time for our holiday in Wales. It'll be good to know exactly where I've been for a change, and not worry about keeping a delicate camera dry and out of harms way. Could this be the bombproof compact that I've been looking for? More later. I got that email too. When I asked for one, they said they'd lend me a camera sometime - I don't want to borrow one , though, everybody else gives me stuff. Did you ever get a camera to 'borrow'? I've had a few of these now and they have never come through, I think they send out the PR hoping we'll help to do their jobs for them. Funnily enough I have had the camera for the last week or so - a full review follows shortly. Personally I wouldn't bother with the GPS version. It works well, but cannot support the OS grid system (Lat Long only). Still, what do you expect for an additional £20?